1/3 of our lives we spend sleeping. So, if you ask me, having the right comforter is really important. To help pinpoint the one for you, I’ve compiled this top-10 list of the best down comforters of 2018. Finding a comforter that is soft and inviting is not always as easy as it may sound, but if you know what to look for, the task becomes a lot simpler. If you are in search of a comforter that maintains the ideal balance between softness, fluffiness, and comfort, then the Egyptian Bedding goose down comforter might be exactly what you have been looking for. Made with a 100% Egyptian cotton cover and 1200 thread count for unbeatable softness, this comforter may be the best example of comfort. This comforter is ultimate luxury, keeping me warm and toasty all night long. Sufficiently fluffy and soft, it feels like falling asleep inside a warm cloud. Finally, edged with a thick golden threading, this comforter looks as magnificent as it feels. 750+ Fill Power for Optimal Fluff: This comforter’s 750+ fill power and 50 oz. fill weight contributes to an unbeatable fluffiness that is divine to sink into. 1200 Thread Count: The 1200 thread count in this comforter paired with the 100% Egyptian cotton cover makes it as soft as can be. I cannot imagine a softer comforter, and the high thread count on this product makes it hard to go back to lower thread count options. Hypoallergenic: As someone who has struggled with allergies in the past, this is an important point for me. This comforter being hypoallergenic makes it ideal for those who suffer from allergies. Gorgeous: Looking just as luxurious as it feels, it boasts thick golden threading along the edges and a pure white cotton material. Weight: A respectable weight that makes you feel comfortable and secure all night long, the comforter feels good to lie beneath. The perfect balance of warmth and weight – it keeps you warm without being too heavy. Perfect Temperature: Unlike other down comforters, this one does not get uncomfortably warm during the night – no more waking up to throw the covers off you, only to wake up again shivering a short while later. Price: The price is incredible – one of the best values on the market. You’d be hard pressed to find a comforter of such high quality priced so low anywhere else. Customer Service: If you do run into a problem, no one wants to have to fight with stubborn customer service employees. The customer service from Egyptian Bedding is friendly and helpful, though, so no need to fear! Loose Feathers: The occasional feather works its way through the fabric, but not enough to be a problem. Challenge to Clean: It is a difficult comforter to clean due to its high fill power and the resulting thickness of the blanket. This comforter cannot be highly recommended enough. It looks beautiful on a bed of any size and keeps you feeling warm and cozy under its light weight all night long. It’s the perfect softness to snuggle up with and doze off into every night. This comforter is certainly one to consider. An affordable option that gives you a lot to love, this luxurious comforter is available in all the most common sizes and checks off all the most important boxes many of us look for when determining a comforter’s quality. With the soft, 100% cotton material, the Royal Hotel dobby down comforter has the perfect amount of fluffiness to make you feel right at home. If you’re looking for the ideal balance between price and quality, you might have found your match here. Hypoallergenic: Like all the best 100% cotton comforters on today’s market, this product is hypoallergenic and will help those who are awake all night in fits of bleary-eyed sneezes. Box-Stitching: This comforter uses box stitching in the manufacturing process to avoid any shifting in the comforter. This prevents certain parts of the comforter from being lumpy, leaving other parts feeling flat and empty – and providing maximum comfort and warmth. Quality Material: The 100% cotton material this comforter is made from cannot be overstated. Providing the user with ultimate softness and warmth throughout the night, this is a must-have quality. Light Weight: The comforter is thick and fluffy as it appears. But to many, this might look like it would be too heavy on them all night long and weigh them down. Quite the contrary, however, the comforter feels lightweight and comfortable around. Easy to Clean: Thanks to the way it is constructed, the comforter is easy to clean when the time comes to wash it. Thread Count: After trying other, higher thread counts on the market, the 300 thread count of this comforter was a noticeable difference. Feathers Fly: While this comforter does stay together well, it is not uncommon for the occasional stray feather to work its way through the material. Anyone looking for a comforter on the more affordable side will find that there is plenty to love about this option – and once it is out of its packaging and has had a full day or two to completely expand, there is plenty of it to love. It’s soft, warm, lightweight, and most importantly, comfortable. However, there are other comforters in the same inexpensive price range with just as much value, even with a higher thread count than 300. If you are concerned about the softness of your comforter, which is closely correlated with the thread count, then you might want to keep looking for something more in the 800+ thread count range. Box stitching maintains the shape of the comforter. Perfect balance of fluffiness and light weight. At 300, the thread count could be higher. Made with 100% Egyptian cotton and boasting a 500 thread count, this comforter is certainly one that anyone searching for their excellent comforter should stop to consider. While it may not be the highest thread count available, it makes up for it by being made from Egyptian cotton and with its 650 fill power. The comfort lock border on the comforter keeps the down in place and the entire comforter in shape. Pacific Coast backs their product with a 10-year limited warranty to prove their confidence in their product – and with good reason. Every night sleeping with this comforter made me feel like I was floating. I felt like I was drowning in softness and luxury in this well-constructed product, all without feeling like the weight of the comforter was overbearing. 100% Egyptian Cotton: Nothing beats the quality of a 100% Egyptian cotton comforter. Anyone looking for the best of the best knows that this is the material to go with, and this comforter did not disappoint. Striped Pattern: Many comforters on the market come in a pure white color, which looks beautiful but some might think it is a little bit boring. I love the added element of elegance and beauty the fine striped pattern adds to the product. 650 Fill Power: The 650 fill power of this product gives it just the right amount of fluff to make it feel like a delicate cloud. 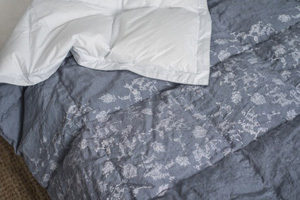 Collapse on top of this comforter at the end of a long day and feel your stresses melt away. 10-Year Limited Warranty: I love this comforter, but who knows what sort of wear and tear it will endure over the years. The 10-year limited warranty it comes with provides the assurance that this comforter will get the job done and last for years to come. Oversized Dimensions: This is truly one of my favorite aspects of this comforter. It comes with oversized dimensions, allowing the edges to drape over the edges of the bed. The result is feeling like there is no end to the large and luxurious comforter while you stretch out in bed. Not the Best Thread Count: At 500 thread count, this option is not terrible, but there is certainly room for improvement. With other 100% Egyptian cotton comforters at a 1200 thread count available in a similar price range, it’s certainly worthwhile to look around for those who consider thread count to be a priority. Not the Softest: While it is adequately filled and immediately transports the user to fluff-heaven, the comforter is simply not as soft as many other options on the market. After trying the top 10 comforters of 2018, I can attest that it is far from the softest contender. Color: While in the picture, this comforter looks like the purest white, I was a little disheartened to find the actual product is not as white as the picture would have you believe. If you plan on putting a duvet cover on the comforter, then this would be a non-issue; if that’s not the case, though, you might want to reconsider. This is a truly incredible comforter, and if you choose to purchase it, you likely will not be disappointed. The oversized dimensions make it feel like a huge, lavish spread, which is a rare quality in such comforters. I could not get enough of this comforter, but it would have been the perfect option if it had only been a bit softer. Depending on what your preferences are, you may want to look for something with a bit of a higher thread count. Not as white as the picture. Egyptian Bedding blows it out of the water again with the Siberian goose down comforter. This product is another comforter boasting a whopping 1200 thread count and 100% Egyptian cotton. The silky-smooth perfection of this option is unparalleled. If you have been looking for a comforter that accomplishes absolutely everything without breaking the bank, this just might be the end of your search. The Price: This is an incredible and affordable price range for a comforter that somehow manages to be the whole package. 750+ Fill Power: With a high fill power, this goose down comforter weighs in at 60 oz. A cushiony delight to sink into, it feels like you are enveloped in a mass of pillows. Hypoallergenic: If you’re anything like me, then a hypoallergenic comforter is a must. Otherwise, it’s just a few short months until I can’t get through the night without watery eyes and uncontrollable sneezing – just another reason I can’t get enough of this comforter. Ideal Weight-Fluff Balance: The balance between weight and fluffiness is perfect. The fill power is intense, making many fear that their comforter will be too heavy for them, but for most people, this is not a problem. 1200 Thread Count 100% Egyptian Cotton: The best quality material you could ask for in a comforter – 100% Egyptian cotton. Paired with a 1200 thread count, this comforter is soft as can be, and you’ll never be able to go back after using such a luxurious comforter. Quilted Stitching Makes for Secure Feathers: The comforter has stitching in such a way that you will find nary a stray feather anywhere in your home. The quilted stitching keeps all the feathers in place so you don’t end up with half of the comforter overfull, and the other half depressingly flat – with the added benefit of keeping your home clean and feather-free. Overly Warm: Depending on what the climate is like where you live or what temperature you prefer when sleeping, you might want to consider the warmth factor of this comforter. It can get extremely hot during the night, which may be perceived positively or negatively, depending on your preferences. Weight: This is a bit of a heavier comforter – I don’t find it to be overbearing, but it is a little heftier than some of the other ones I tried. For those looking for something truly lightweight, it might be a good idea to keep searching. This comforter is extremely soft, plush, warm, and sturdy. This is certainly one of the best down comforters I tried – if you are not terribly concerned about finding a lightweight comforter that is not too warm, then you may have found your comforter match made in heaven here. Extremely high fill power and thread count. The baffles maintain the size and shape of the comforter. High-quality material made from 100% Egyptian cotton. Not ideal for those who like cooler temperatures in the night. Heavier than some might prefer. I can’t get enough of these 100% Egyptian cotton comforters! Another incredible-feeling poofy comforter that feels like falling asleep inside a gentle cloud, the Pacific Coast European down comforter has its own unique distinguishing factors that set it apart from the others on the market. Easy to care for with low-maintenance upkeep requirements, not to mention being constructed from supreme quality materials, this comforter is certainly worth looking at. Anyone searching for something soft and cozy that requires minimal upkeep should give this one a chance. I also loved the fact that this comforter was made in the United States. If you are someone that prefers to support US companies, then that’s something you will want to take note of that makes this comforter a unique product. The fact that this option comes with a warranty from the manufacturer shows their confidence in their product. From the moment I received it, I could tell this was a high-quality comforter, and the 10-year limited manufacturer’s warranty only further backs that. 100% Egyptian Cotton: By now, you should know that I don’t think anything else measures up to Egyptian cotton. The softness and high quality of the material are unparalleled, and you probably won’t be able to help but notice the quality of the comforter when you unpackage it and feel the material. Striped Pattern: This is especially a benefit if you don’t plan on putting a duvet cover on your comforter, but the striped pattern offers an interesting visual element that is much more attractive than plain white alone. However, if you’re just going to stuff the thing in a duvet cover anyway, this won’t matter much to you. 650 Fill Power: With its excellent fill power, this comforter is nicely cushioned and makes for just the right amount of fluffiness that will likely keep you adequately cozy throughout the night. The down adds up to a perfectly plush fill weight of 34 oz. Baffle Box Design: The baffle box design is ideal when it comes to keeping the down in place long-term so you don’t end up with a comforter overly filled on one side while the other is flat as a pancake. The baffle box construction prevents the comforter from getting lumpy over time, which should help it to last for the long haul. Barrier Weave Fabric: The comforter is made using 420 thread count Egyptian cotton with a Barrier Weave fabric, which is durable and soft – but the real selling point of this material is that it is designed to prevent the down from sneaking out of the comforter. No one likes to have down slipping out on their comforter and ending up all over their floor, but this helps safeguard maximum fluffiness of your comforter for the long haul. Hyperclean Pyrenees Down: The 650 fill power Hyperclean Pyrenees down serves the purpose of providing bigger, poofier clusters that offer exemplary insulation, meaning that you can enjoy cozy comfort during all seasons, almost regardless of the climate. While you might still want to turn the thermostat down a few degrees on the hottest of summer nights, I found that this option was perfectly warm in colder climates without being sweltering when it was warm outside. Easy Care: As someone who doesn’t like to do a lot of extra work, I loved this aspect of the Pacific Coast comforter. The comforter is only recommended to be cleaned every 3-5 years, which is just fine by me as it saves me needless trips to the dry cleaner’s! Made in U.S.A.: For me, it is always preferable to have products manufactured in the U.S.A. whenever possible. This factor was just another perk of an amazing comforter! Thread Count: I’m not going to lie, the thread count did have me a little concerned – at a respectable 420, it could be worse, but it’s not the luxurious 800+ that I love in my favorite comforters. That being said, I still was impressed with the softness of this comforter considering its thread count. Needs Fluffing: Every few days, you may notice that the comforter seems flatter than before. 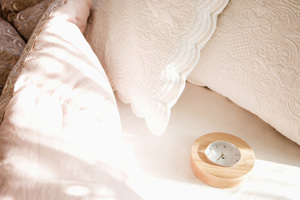 A quick fluffing every few days will do the trick to fix this right up, but to many, this is a huge downside – for me, I just give it a few shakes while I am making my bed in the morning and the comforter stays just as fluffy as I like it with no problem. This is a great comforter from a company that clearly takes pride in the products they create and will stand behind them. What impresses me about the comforter is not the advertised “exceptional and rare Pyrenees Down from the renowned Pyrenees Mountain region of France”, but rather, the astonishing performance of the product. Nothing is better, in my opinion, than a comforter that can keep you warm in the cold months without making you wake up sweating when it’s warmer outside. I certainly recommend giving this comforter a try if it sounds like the one for you. Only needs cleaning every 3-5 years. Baffle box design maintains comforter shape. Striped pattern gives it a good look. Flattens after a few days without being fluffed. The mid-range thread count material isn’t as soft as it could be. Egyptian Bedding does it again with their Hungarian goose down comforter! So many of Egyptian Bedding’s products have made the cut for the top 10 selection because they seem to never fail to deliver. This comforter has its own unique points to consider, setting it apart from the other comforters coming from the same manufacturer. It’s a warmer comforter, so it’s not ideal for those who like to enjoy cooler temperatures while they sleep – but if you’re someone who likes to snuggle up in the heat of their blankets, then this comforter might be what you’ve been looking for. However, of all Egyptian Bedding’s products, this one certainly is not my favorite. While I still have plenty of good things to say about the premium thread count, 100% Egyptian cotton, baffled design, and supreme fluffiness, this one is not in the same realm as some of the others I have reviewed. Of all the comforters I tried, this one was among the worst I have reviewed as far as feather leakage goes. While it does help me get a good night’s sleep, I need the extra energy to sweep my floor every morning after making my bed. That being said, this comforter is also among the best I have reviewed in terms of fill power. At 750, there’s little room for debate – this is a fluffy comforter. It’s reasonable to say that the higher fill power may contribute in some way to the excessive feather spillage, but after sleeping in this mass of coziness, I can say it’s almost worth it. 750 Fill Power: As stated above, this is among the highest fill power comforters I have reviewed – and it shows. The comforter has a 50 oz fill weight, stuffed with 100% goose down. Premium Thread Count: While not as high as the thread count on some of the other comforters I have reviewed by Egyptian Bedding, 800TC is nothing to turn up your nose at. Noticeably soft and luxurious, compared with the supreme plushness from the high fill power, this comforter is incredibly comfortable. Hypoallergenic: Settling into bed at night with a comforter that makes your eyes water and causes uncontrollable sneezing is a recipe for disaster. I love that this option is hypoallergenic, repelling things like dust mites and other nasty allergens. Baffle Box Construction: The superior construction of this design keeps the down evenly distributed, which is a foresight that I greatly appreciate in my comforters. The baffles also prevent the comforter from getting lumpy and uncomfortable over time, ensuring it retains maximum coziness for the long haul. 100% Egyptian Cotton: When Egyptian Bedding says Egyptian cotton, they are not messing around – the material is made from the Long Stable Giza Cotton that can be found grown in the Nile River Valley with all its lush greenery. This truly sets the quality of this comforter a notch above the rest, and even if you aren’t particularly concerned with precisely where the cotton came from, you will care about how soft it is. Down for Days: While I love this comforter, the down escaping all over the place was a huge drawback. Prepare for mornings that look as if a flock of geese ran through your bedroom after purchasing this comforter. Weight: This is a heavier comforter than most – another unfortunate side effect of having so much down. If you’re not one who likes to sleep with a lot of weight over you, then you might want to pass up this comforter. This is yet another great product from Egyptian Bedding, but certainly not their best work. While it has very high fill power and you can certainly enjoy the benefits of that with this product, there are some drawbacks. That, paired with the fact that this comforter does not come with as high as a thread count as the other Egyptian Bedding options makes it one of my lesser favorite options. Don’t get me wrong though – it’s a great product, it just wasn’t at the top of my list. Baffle box construction keeps the down evenly distributed. Down leaks from the comforter excessively. Pinzon certainly knows comforters, and their hypoallergenic white goose down comforter proves it. I loved finding sanctuary in the soft pillows of its baffle construction and thick fluff. If you suffer from allergies or are looking for something that will shield you from the wind on cold winter nights, then this comforter might be the one that ends your search. It kept me supremely warm all night long, comfortably cocooned in its plush softness. Made in U.S.A.: I love to buy from companies that make their products in the U.S. This might not matter to you and may not be much of a deciding factor, but if supporting U.S. manufacturing is among your priorities, then this is certainly an aspect to consider about this comforter. PermaBaffle: In addition to preventing shifting of the fill and providing an even distribution, the baffle construction also provides an extra thickness to the comforter. The PermaBaffle construction used in this Pinzon comforter is something you can tell is high quality right away. Machine Washable: Most comforters need to be dry cleaned to stay in the best possible condition for the long run, but this can be a real inconvenience. I love that this comforter can be machine washed in the comfort of my own home. Made in OEKO-TEX Standard 100 Factory: This comforter was made in a factory with an independent certification system designed to ensure the textiles produced there are compliant with high environmental and safety standards. If responsible production is high on your list of priorities, then that’s certainly worth noting. 40 oz of fill: At 40 oz, this comforter has a nice thickness that I really enjoy without being overly heavy. It makes it just the perfect weight to keep you warm all night long without being overbearing. Price: This comforter is easily one of the most expensive products I have reviewed. While I certainly thought that this was a fantastic option, there were others in more affordable price ranges that I have reviewed that I liked even more. Down Fiber Fill: Another notable downside of the Pinzon comforter is that it is only 75% goose down and the other 25% is fiber fill stuffing. While it is mostly goose down, for the price, I felt like it should have been 100% goose down. Overall, this is not a bad comforter at all. It is comfortable and warm throughout the night, which kept me feeling cozy and content. If price is not an object for you, then you might find this comforter to be the perfect match – if you’re shopping on a budget, however, it’s good to note that there are plenty of great comforter options in a cheaper price range as well. The PermaBaffle construction keeps the down securely in place. Machine washable for additional convenience. Made in U.S.A. according to high environmental and safety standards. Good balance between weight and warmth. One of the more expensive options on the market. I can’t deny that this Eddie Bauer comforter is cozy and comfortable, and with so many great features that it offers, it’s certainly a wonderful product in my opinion. There are several things about this comforter that set it apart from many of the other top comforter options I reviewed that I feel are certainly worth looking at. This comforter offers convenience by being machine washable and dryable, it’s assembled in the USA, and it comes with the incredible oversized dimensions that I love – they look great draped over the edge of my bed, and they give me so much more comforter to snuggle into in the middle of the night. There are a few drawbacks, like it not being as soft as I would have liked and the fact that it’s not suited for the coldest climates, but depending on your preferences, those might end up being the types of qualities you will love in a comforter. 700 Fill Power: The 700 fill count is supreme, lending itself to an extremely thick and poofy comforter, giving me plenty to get comfortable buried beneath. I love having a thick comforter. Striped Damask Cotton: The striped damask cotton not only has a high-quality feel to the touch, but it also has a classic look that matches just about any decor. I really admire the striped pattern, especially as I often don’t put duvet covers on my comforters – this adds an elegant touch to the bedroom with ease. Oversized Dimensions: Yet another thing that contributes to the incredible look of this comforter is its oversized dimensions. With the edges of the blanket draped over the edge of the bed, it looks luxurious, and it feels just as luxurious when you are sprawled out beneath covers that seem to go on forever. Hypoallergenic Filling: No matter how comfortable your comforter is, you will never be able to get a good night’s sleep in it if you are waking up sneezing all night long. If you are sensitive to dust and other allergens, then a hypoallergenic comforter is the way to go, which is yet another thing I love about this Eddie Bauer comforter. Assembled in U.S.A.: For me, having a product assembled in the U.S.A. is a considerable perk. It means that the quality is typically higher, but I also love supporting U.S. manufacturing! Machine Washable and Dryable: I love the convenience of being able to machine wash and dry my comforters, saving me a trip to the dry cleaners, as well as the expense of having it professionally cleaned. As comforters don’t need to be cleaned that often, it’s really easy just to throw these into the wash when the time comes. Lower Tier Thread Count: At 350, this thread count is unquestionably a lower tier material. After reviewing options in the 800+ range, I can easily tell the difference between economy material and luxury material – and you can guess where this one landed on my personal scale. Lightweight: This is something that could be perceived as a good thing or a bad thing, but because I prefer comforters that work in all climates, I consider it to be a drawback. The comforter is advertised to be designed for summer or “hot sleepers” meaning that it’s not as good as fighting against the cold as many other comforters that I tried. Extreme Shedding: I can handle a few stray feathers here and there, but this was just intense! Sometimes it felt like I would need to sweep the floor after only making my bed, so if this is something that gets especially frustrating for you, then I would suggest that you search on. There are a lot of good things to say about this comforter. Although there were a few downsides, one of the biggest for me was that it didn’t keep me warm enough on the coldest nights – however, if you’re a hot sleeper or if you live in a place where it doesn’t get extremely cold, then what was a drawback in my book could be a huge advantage in yours! Overall, this comforter was great and I have very few bad things to say about it. Unless you’re extremely concerned about low temperatures where you live, then this just might be the comforter that ends your search! 700 fill power makes the comforter thick and fluffy. Striped pattern gives a classic look. Hypoallergenic for those sensitive to dust. Can be washed in the convenience of your home. 350 thread count not as soft as it could be. Not warm enough for most during colder months. The Puredown white goose down comforter was certainly a pleasant surprise for me. The luxury white goose down supplies medium warmth and plenty of comfort. The 600 fill power results in a 37 oz filling, and the cover is made from leak-proof 100% cotton with 500 thread count and a sateen striped weave. The leak-proof cover is certainly a nice addition to the comforter because it prevents your bedroom from looking like a gaggle of geese is taking refuge in your home. Another comforter with baffle box construction, I am confident that the down in this comforter will remain in place long-term. The added satin piping with four corner tabs anchors the duvet cover and gives it a nice, elegant look – paired with the classic stripe pattern, this should be able to match any room’s decor. I truly think this is a comforter that is well-suited for all seasons. As it is not too heavy or overly warm, it doesn’t cling to heat and leave you sweating in the summer in the middle of the night and at the same time, it is insulated enough to keep you warm when the air outside is too frigid to handle. Baffle Box Construction: In my opinion, baffle box construction is a must for any down comforter. It keeps the down in place so you don’t end up with a lumpy and lopsided comforter, which is something I greatly appreciate. Classic Look: The classic look of this comforter is a definite selling point. It looked great in my bedroom and I imagine it would blend right in with just about any room. Perfect Thickness: I am always on the lookout for a comforter that keeps you warm all night long without crushing you with its weight, and that’s just what the doctor ordered with this product. Ideal Temperature: I love a comforter that’s warm enough for you to be able to snuggle up with without being overly warm. This comforter does just that, keeping me toasty from head to foot without making me wake up sweating in the middle of the night. Leak-Proof Cover: Waking up to feathers all over your bedroom floor gets old extremely quickly, so I loved the leak-proof cover on this comforter. It keeps the down just where you want it – securely inside the baffle construction. Thread Count: At 500, the thread count is very respectable, but there is certainly room for improvement in this area. 500 thread count cotton material is a mid-range quality, and it provides a reasonable softness, but if you’re looking for the softest of the soft, then you might want to keep looking. Dry Clean Only: I don’t like making extra trips to the dry cleaner when I don’t need to, but as comforters generally only need to be cleaned a couple of times a year, I suppose it’s not that big of a deal. However, I think it’s always convenient to be able to throw your comforter in the dryer. This is a decent comforter that is certainly worth considering if you are looking for something reasonably soft and comfortable. After trying several the more luxurious comforters, I can certainly say that this one is a mid-range product by comparison – but still plenty plush and comfy to get you through the night. Baffle construction keeps the down securely in place. Has a classic look to match any decor. Ideal thickness – poofy without being overbearing. Leak-proof cover keeps feathers inside. Royal Bedding’s down comforter makes the list of the top 10 comforters 2017 because there is a lot to be said for its quality and features. While it may not have been my favorite comforter for those I reviewed, the benefits were substantial enough to give this comforter its rightful place in the top 10 list. An ideal comforter for those looking for a balanced comforter with a lot of fluff. Although the thread count lands in the mid-range category, it is still soft enough that I can’t help but snuggle with it. The comforter is stuffed with 90% down and 10% small down feather. A decent mix, the comforter feels as huggable as ever and is a great way for me to be lulled into a sound sleep all night long. The price was a bit on the higher side, especially compared to some of the cheaper comforters I reviewed and even liked much more than this one. Still, I can recognize that this comforter is of good quality and comes at an affordable price. 750+ Fill Power: 750 is an unquestionably luxurious fill power for this comforter to possess. Easily among the fluffiest of all the comforters I have tried with a 50 oz fill weight, this product slowly fluffed up after I removed it from the packaging and seemed to never stop. Hypoallergenic: If you suffer from allergies, then you know that getting a hypoallergenic comforter is a must if you don’t want to wake up in the middle of the night in an unstoppable fit of sneezes. I love that this comforter is safe from dust mites and other allergens so I can sleep soundly. Medium Warmth: This comforter is advertised as being of a medium warmth, and I would say that this rating is very accurate. I don’t feel overheated during the night, and this product is effective in shielding me from the chilly night air. Baffle Box Construction: Baffle box construction is one of my favorite things to see in a comforter. Not only does it keep the down within the comforter in place and help it maintain its position, but it also adds extra thickness to the comforter and can make it feel more plush and fluffy. 100% Cotton: The Royal Bedding down comforter is made from 100% cotton and you can tell. Nice and soft, you can tell that Royal Bedding is using quality materials. Side Gusset: A unique addition to this comforter is the side gusset that allows the comforter to show off its full thickness and provide the user with maximum warmth throughout the entire comforter. Mid-Range Thread Count: While the comforter is reasonably soft, a thread count of 500 is certainly mid-range. Many of the other comforters I tried were of higher thread counts, and if softness is a priority for you, I would recommend skipping this comforter – 800 and above tends to be the ideal range for luxurious softness, in my opinion. Dry Clean Only: While it is not a huge concern because comforters only need to be cleaned a couple of times a year, most people don’t like to take a trip to the dry cleaner’s when they don’t have to. If you value convenience as much as I do, you’ll want to keep in mind that this product is dry clean only. Price: While not being absurdly overpriced, I think it’s worth noting that this is one of the more expensive comforters that I have reviewed. Some of the other ones I found were cheaper, even while offering more value. Cheap Sheen: The outer material of the comforter has a sheen appearance that ends up looking cheap. It does not have the cotton cloth look that you would expect from a high-end comforter, although it feels fine to the touch. This is not a bad comforter, and I certainly think it is a good buy. For those looking for a comforter with utmost fluffiness being among their highest priorities, you might find that this comforter is your absolute favorite. Incredibly fluff and thickness with 750+ fill power. Hypoallergenic for those sensitive to allergens. Side gusset helps keep you warm all night long. Baffle box constructions maintains even distribution of down. Relatively low thread count, at 500. The outer sheen has a cheap appearance. Is your sleep suffering from not having the right comforter for you? You’re not alone. Finding a comforter that you are 100% satisfied with isn’t easy for anyone. Whether your current comforter is making you feel suffocated in heat, or is so heavy that you feel like you’re drowning beneath it, I’ve got your back. There are a lot of common problems people run into with comforters, and I’ve likely seen or experienced them all – and found the best solutions. A good night’s sleep has a lot to do with how healthy you are, and having the right comforter to get you through the night seamlessly can go a long way to contributing to a deeper sleep. Don’t spend any more time feeling bleary-eyed on your morning commute to work or telling your friends you need to go home early this weekend because you’re just too tired. With my help, you can find the right comforter for your unique sleeping habits that will promote a deep and healthy sleep all night long. The right comforter for you might not necessarily be the right comforter for someone else. Different people need to look for different things in a comforter depending on their own unique preferences and sleep habits. When choosing the comforter that is best for you, there are several factors you’ll need to look at, such as fill power, weight, thread count, and more. But more on that later. There are plenty of incredible comforters available on the market, but finding the right one can still be an incredible challenge if you aren’t well-informed. Once you know your specific preferences and what will work best for your night-time routine, however, the rest becomes easy. With options all over the spectrum, rest assured that the comforter of your dreams is out there. But just thinking about all the research you might need to do to find the ideal product is enough to give you a headache. Fortunately, I’ve done the research part for you. All you need to do is decide on all the qualities you are looking for and make a list of priorities. Once you’ve settled on what’s most important to you in your ideal comforter, decide on a price range and read all my down comforter reviews in the range you can afford. From there, you will be able to find one that matches perfectly with your needs. The right choice will be obvious, sporting just the right price, style, and features combination. I promise, the comforter for you is out there – you just need to find it. If you don’t have experience in the industry, then you probably don’t know a lot of the terms commonly used to describe comforters. In fact, trying to read about them might feel like trying to decipher a language you’ve never heard before. Fortunately, I’ve compiled a handy guide here to serve as your translator during your journey to finding the perfect comforter for your home. Baffle Box Construction: Baffle construction is a term that refers to comforters that have individual squares stitched into the comforter, creating vertical interior walls stuffed with the down inside. As a result, this prevents the down from shifting over time – so, there’s no need to fear ending up with one half of your comforter being lumpy and overstuffed while the other is flatter than a pancake. Down: Comforters are filled with an insulating material such as cotton, silk, wool, polyester, or down. Often from geese, but other birds are used as well, down is a bird’s soft feathers found under their tougher exterior feathers. Egyptian Cotton: As you might expect, Egyptian cotton comes from Egypt – specifically the species Gossypium Barbadense, which produces longer fibers than all other types of cotton. Their longer fibers mean more strength and, hence, durability – but the material is also softer and able to yield a higher thread count fabric than other types of cotton. Fill Power: Referring to the loft or fluffiness of a down product such as a comforter, fill power is loosely relating to the down’s insulating power. The higher the number is representing fill power, the more air can be trapped by an ounce of the down within – resulting in greater insulating ability and warmth. Hypoallergenic: Some comforters are designed to be hypoallergenic, and are thus safe to be used by those who are sensitive to allergens. There’s nothing fun about using a comforter that makes you wake up in uncontrollable sneezing fits in the middle of the night with watery eyes, so if you’re sensitive to allergens, then you will want to make sure that any comforter you buy is hypoallergenic. Side Gusset: A side gusset is a sewn finish that is used to increase the durability of bedding. Rather than stitching the top and bottom together, the side panel around the border helps the comforter to be as thick as possible and distribute the warmth evenly throughout the comforter, as well as increasing its durability. Thread Count: If you are someone who pays specific attention to how soft your comforter is, then thread count is something you will want to pay special attention to. The higher the thread count is of the comforter, the softer the material is as a result. Oversize Dimensions: There are standard dimensions for all the different bed sizes available, and this goes for comforters as well. With oversize dimensions, however, the manufacturer intentionally produces a larger comforter to allow the blanket to fall luxuriously over the sides of the bed and provide plenty of comforter to snuggle up with. The comforters you look at tend to fall into three distinct classifications. Economy – Economy comforters will be in the cheapest range, such as under $100. As a result, they will have a low thread count, low fill power, cheaper material, and are not built with as much quality and durability to last for the long run – although if you are looking for something basic, they will probably get the job done just fine. Mid-range – Comforters in the mid-range category tend to have a good balance between quality and price, typically priced somewhere between $100 and $200. Higher thread counts in the 400 to 800 range, and usually featuring fill powers of 500-600, these comforters are reasonably soft, fluffy, and snuggly. Luxury – Comforters in this range are the best of the best, if you can afford them – they can cost as much as $300 and above, but sometimes you can find some in the $150-$200 range as well. Typically, with thread counts between 800 and 1200 for ultimate softness, and fill powers of 600 and above to provide unbeatable insulation and thickness, these comforters are doing it right. Most of the comforters I have reviewed tend to fall in the mid to luxury range, and I found what I believe are truly some incredible gems. To help you find your perfect comforter, decide on what your priorities are – and your price range – and determine whether you think an economy, mid-range, or luxury comforter is right for you. Then, all that is left is to begin your search and buy your perfect comforter. The best down comforters on the market will give you the quality of sleep you deserve all night long and last for years to come. An immense sort of comfort and coziness, there’s likely nothing better at the end of a long day than knowing that your perfect comforter is waiting for you – this is why it is so important to make the right decision. By following the tips and guidelines here, I’m certain you’ll find yourself sinking into a comforter that provides you with the ultimate level of comfort in no time.